As the highest wind speed ever was recorded on a Finnish island Tuesday night, turbines churned out electricity, although output fell short of the record. Record-strong winds pushed the price of electricity down early Wednesday as they kept wind turbines spinning during a major winter storm. The market price of electricity fell to just over four euros per megawatt-hour (MWh). That is roughly one tenth of the recent average price. "Electricity was certainly cheap last night. Of course electricity consumption is significantly lower at night than during the day, but when there is high output from wind turbines, it tends to depress the market price," says Arto Pahkin, network operations manager at national grid operator Fingrid. During the night the market price for electricity dipped to 4.04 euros per MWh, about 10 percent of the normal price of late. Although record-strong winds were recorded, this was hardly a record low price. Pahkin notes that, for instance, one night in the middle of last October, the market price fell to 1.92 euros per MWh. Pahkin explains that the market price is simply determined by supply and demand. According to the Finnish Meteorological Institute (FMI), the strongest wind ever recorded on land in Finland was clocked overnight on Bogskär, a cluster of small islands that marks the country’s southernmost point, south of the Åland Islands and east of the Swedish capital, Stockholm. A 10-minute average wind speed of 32.5 metres per second was recorded, with gusts of up to 41.6 m/s. Even such brisk winds were not able to churn all of Finland’s turbines at full capacity, though. The average output overnight was around 1200 megawatts, well short of the record 1800 megawatts. As of Wednesday afternoon, prices were back up to around normal levels. During some daytime hours, the price typically rises above 50 euros/MWh. Pahkin notes that customers with dynamic electricity price contracts, which fluctuate according to the market price, see immediate benefits from low prices, while others benefit in the long run. Experts say that in future Finland may have situations where wind-generated electricity exceeds demand, as already occurs in windpower-heavy Denmark and Germany. In this case, the price becomes negative as utilities struggle to find users for their surplus output – which can be shared over national borders. In 2017, windpower accounted for 5.6 percent of Finland’s electricity consumption, well below the level in Nordic neighbours Sweden and Denmark. 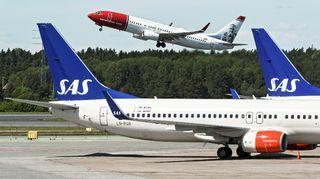 SAS said that the strike would affect some 170,000 passengers’ plans during the weekend.